In State at 10 AM until Mass begins. 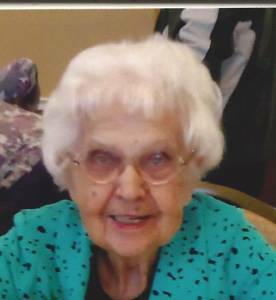 Helen Oleksiak., age 92, passed away August 2, 2016. She is preceded in death by her husband, Joseph and her son in law, Thomas. Loving mother of Patricia Jakubowski. Beloved grandmother of Thomas Jakubowski (Linda) and Rachel Eklund (Harold). Cherished great grandmother of Brandon, Nathan, Bethany and Abigail. Family will receive friends Monday 2-8 pm at the Neely-Turowski Funeral Home, 45100 Warren Road, Canton (between Sheldon and Canton Center Rds) with a Rosary at 7 P.M. Funeral Mass Tuesday 10:30 A.M. at St John Neumann Catholic Church, 44800 Warren Rd, Canton. In state 10 A.M. until mass begins. Interment St. Hedwig Cemetery. In lieu of flowers family suggests donations to Capuchin Soup Kitchen.